An easy fast-start route to save 10% - 30% on fuel costs. XFT – Xtreme Fuel Treatment saves YOU money on Fuel ! 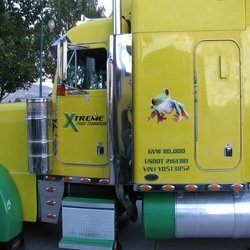 XFT is an easy to use, great value fuel additive, that utilizes a unique chemical formulation to bring you the most effective solution available. It has multiple components, which means nobody else has what we have, and no other product does what XFT does. Because XFT is a comprehensive approach, it would take many products mixed together to even come close to giving you the same benefits! Example Savings: A Fleet using 35,000 litres per week at 10% savings – saves 3500 litres = £3500 cost (£1 litre assumed). Cost to treat : £1050 – net savings = £2450 x 50 = £122500 saved per year; or, at 20% increase – almost £1/4 Million. Average time to dose in bulk tank – 10 minutes per week! 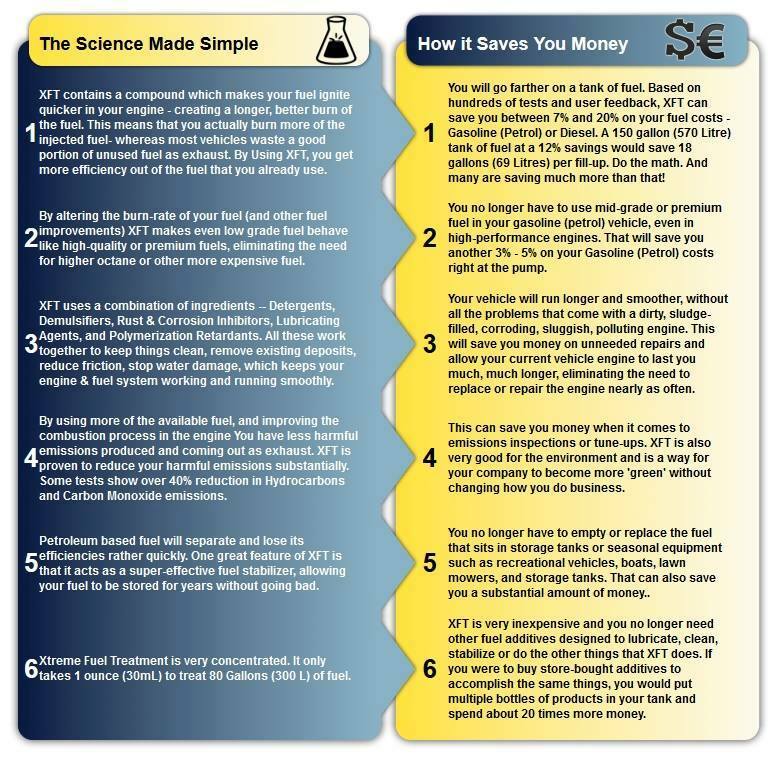 Typical cost of Xtreme Fuel Treatment is 4p per litre, Typical savings is 8p – 30p per litre due to increased mpg. We have packaging sizes from a 5ml sachet to a 200 litre drum; treating from a few litres via a 30ml dropper bottle, to single tanks on cars and vans – 5ml and 10ml foil pack sachets, to bottles with dosing spouts treating in total per bottle, 600 litres to 4800 litres. 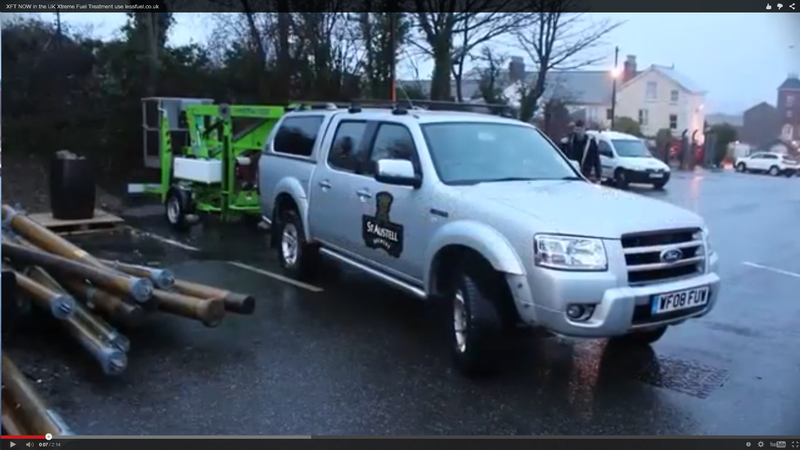 Or a 3.5 litre bottle to treat 35,000 litres – eg bulk storage in a transport co. yard. Or, the drums for larger companies, mines, quarries etc. Over the last 20-years, XFT was mainly distributed to the industrial marketplace, as a solution to extend the operating hours between service repairs and to help improve fuel economy and reduce emissions. In 2008, Syntek Global released XFT to the public making it a viable solution for any size operation. Multiple mass-carbon balance tests, independent lab tests, fuel consumption tests, and case studies on various engines have been performed to prove the effectiveness of XFT. If you are a Commercial Operator or Fleet Owner, we have a free stock offer for qualifying businesses, this is worth up to approx £1250 of product and should yield between £3500 and £10500 worth of fuel savings. – We can also talk with you about using Xft, getting started as soon as possible to maximize savings. There is no up-front capital equipment needed, and we have flexible ways to use XFT according to your style of business operations. – Get in Touch! A little XFT goes a long way – Miles ! Do a Risk-Free 6 Tank Challenge !